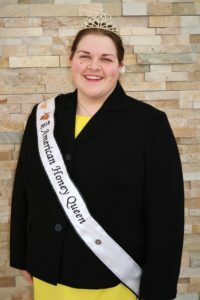 Kayla Fusselman, the 2018 American Honey Queen, will visit Louisville, KY August 16-22. She will make appearances at the Kentucky State Fair during her stay, speaking to fairgoers about the importance of honeybees to the public’s daily lives and how honeybee pollination directly shapes our livelihood. She will also share information how honey’s beautiful spectrum provides endless possibilities and the many treats that honeybees provide. Kayla will make appearance throughout the fairgrounds and will be present at the Kentucky State Beekeepers Association exhibit. For more information on Queen Kayla’s Kentucky visit and to schedule an interview, contact Tammy Potter at 859.200.2207.